This 10 gallon IPC Eagle CT40 automatic floor scrubber is great for cleaning in all types of settings. It was designed with medium sized environments, like supermarkets and convenience stores specifically in mind. The 20 inch scrub path and 0 degree turn radius allow this machine to scrub, and turn around in very tight spaces. The drive system is brush assisted, so the effort needed to push this machine around, is very small. The brush practically drags the machine around behind it. The machine comes standard with a nylon scrub that will remove the dirt tracked in by normal foot traffic. Keep your supermarket looking great with this 20 inch auto scrubber. 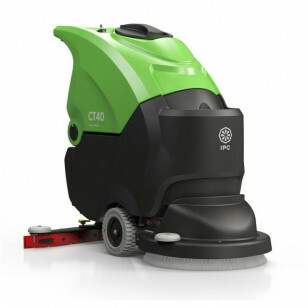 We also have many other walk behind floor scrubbersincluding other great IPC Eagle commercial scrubbers to choose from, some large and some small. You're sure to find just the right machine for your floor scrubbing job with us!